Elizabeth Erwin loves to report on issues and events that bring awareness to her community. One of her favorite stories she covered was the National Special Olympics in Iowa last year. "It was so great to see the spirit and the drive the athletes have," Erwin said. "Athletes came from across the country to compete, make new friends and share their stories. It's so inspiring to see how much they've had to overcome and yet how positive they are." It only took one mass communication class for Erwin to know that broadcasting was for her. Erwin's mother, Margaret Olson, knows that her daughter has always been a people person. "That, combined with her love for writing and her inquisitive nature, made this a perfect match," Olson said. "She will not stop a job until it is done and done right." Erwin graduated with honors from Southern Illinois University Edwardsville in 2005 with a bachelor of art's degree in mass communications and has been successful ever since. While in college, she was awarded the Press Club of St. Louis Award. She is currently working as a reporter and anchor at WOI-TV in Des Moines, Iowa. Before landing her position at WOI-TV, Erwin started her career as a reporter and fillin anchor working for KCAU-TV in Sioux City, Iowa, within a few months after graduation. Within six months, the vice president of KCAU-TV noticed Erwin's talent and promoted her to KCAU-TV's sister station in Des Moines, Iowa. "I love reporting and anchoring," Erwin said. "To me, it's not a job, it's fun." At 24 years old, it wasn't the interviewing of all the presidential candidates that made her nervous, it was when she was chosen to interview Ty Pennington and Patrick Dempsey (McDreamy) that she "freaked out." While Erwin attended SIUE, she was a reporter for WSIE 88.7-FM and was the host for SIUE's Global Village. She believes both programs have helped her get where she is today. "I needed both of them in order to be a reporter," Erwin said. 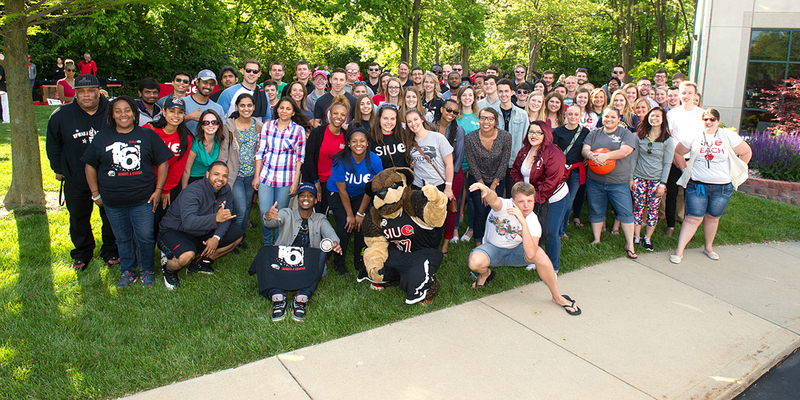 "WSIE helped my writing and news judgment, and SIUE Global Village helped me become more confident in front of the camera and taught me how to talk to an audience." Not only were the two shows beneficial, Erwin also credits her mass communications professors Riley Maynard and Kimberly Voss for being great mentors. "Dr. Maynard really knows how to engage students and make them want to learn more," Erwin said. "He prepared me for the real world. And Dr. Voss is amazing. I learned so much from her." Voss returns the compliment to Erwin and considers her a special student. "I was always impressed with her work," Voss said. "I've been teaching at universities for more than a decade and Elizabeth was the kind of student who stands out. She has great skills, but also saw the big picture in terms of critical thinking. She asked the right questions." Erwin interned at KPLR-TV while in college. She said it was there where she got her hands-on experience. For the first time she got to "see the fast-paced world." "It's tough, but if you really love it, it's really worth it," Erwin said. "Every day is different. It's telling of what we do. I have learned about so many different things." Her two favorite kinds of stories to report on are "the funny and goofy ones with quirky people, and doing stories that change lives for the better." Erwin grew up in the small town of Minooka, Ill., and is happy to be reporting in the Midwest. When Erwin is not covering a story, she enjoys taking her Yorkie "roommate," Bianca to the park, spending time with friends, and shopping. "When I am done exploring, I would love to work in Chicago because my family is there," Erwin said. "But that's not for awhile." For now, Erwin loves where she is, but she will continue to get excited when she visits home during the holidays.